Hyderabad: Bajaj Auto sometimes ago rolled 400 cc bike by all-women engineers’ assembly informs Automobile Expert, Former Senior Executive General Motors Dr. Rao M. Chalasani, who is also the MD of Deccan Auto Ltd while addressing a largest gathering of Mechanical Engineers, most of them women at BVRIT recently immediately after inaugurating Telangana’s first Indian Pro-Kart Endurance Championship (IPEC 2018)and Asian E-Bike Challenge kicked at B.V.Raju Institute of Technology(BVRIT), near Hyderabad at Narsapur. Dr. Rao, the MD of Deccan Auto, a Rs 250-crore bus making unit, the first Integrated bus manufacturing plant in India said women are more efficient and proven than men. Many women were behind Bajaj Auto’s wheels. Bajaj Auto’s Chakan plant has a unique feature – it has women only assembly lines and these women make some of the most powerful motorcycles in the country. Well over 130 women are said to be working in that plant. Women are found to be working in two main assembly lines–Vehicle Assembly and Engine Assembly lines. Yamaha Motor’s at one of its facilities in India said to have an entire assembly line for scooters was dedicated kicking off with 200 women in late 2012. Girls are working on the Assembly lines of Ford Motors added Dr. Rao. Until recently more girls used to prefer IT stream in Engineering. As IT losing its sheen, more girls are opting Mechanical Engineering. Women are gearing up for careers in the auto industry. Mechanical Engineering is no longer a male dominated industry, add K.V. Vishnu Raju, Chairman of Sri Vishnu Educational Society. It is not only Mechanical Engineering, but also Chemical Engineering which is now preferred by many girls. They are the core engineering subjects, adds K.V. Vishnu Raju. 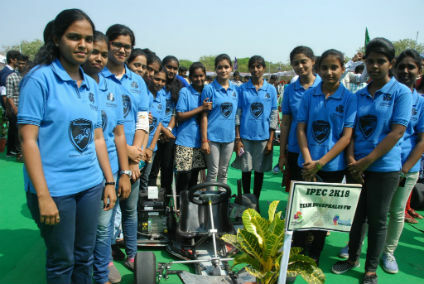 A Telugu Mechanical Engineering girls from Shri Vishnu Engineering College for Women, Bhimavaram bagged First Runner-Up prize in BAJA SAEINDIA 2017. BAJA SAEINDIA is a national-level intercollegiate event which takes place every year. BAJA SAEINDIA gives engineering students an opportunity to showcase skills in designing 4 wheeled, single seater, all terrain automobiles. These vehicles are evaluated on the basis of Static, Dynamic and Durability events taking into consideration design, cost, presentation, build quality, innovation, acceleration, maneuverability, hill climb, suspension, traction and endurance informed Vishnua Raju. Now women are drawing better salaries than men in automobile industry, he informed. China has women working in Heavy Mechanical Factories. That culture is coming to India now, he said. John Deere India, a company founded in 1837 and a Fortune500 Company said to have hired good number of women. It is the world’s leading manufacturer of agricultural, construction and forestry equipment company. The management of automobile sectors think women bring more discipline and better productivity, informed Dr. Y. Murali Krishna, Prof. & Head Dept of Mechanical Engineering, B.V. Raju Institute of Technology. According to some Mechanical Engineering students at Indian Pro-Kart Endurance Championship event, Maruti, Mahindra & Mahindra are recruiting more women. Mechanical engineering is traditionally a male-dominated stream. It is attracting more and more women students. The numbers are not yet so significant but soon it will change informed Dr. Y. Murali Krishna. “Earlier top scorers in EAMCET would go for IT, but now its mechanical,” says Dr. A. Padma Rao, Prof. Dept of Mechanical Engineering. There are a lot of reasons for this. The IT industry has been losing its sheen. The emergence of artificial intelligence, machine learning, Augmented Reality, Virtual Reality, Cloud Computing etc took a toll on some companies in the digital technology space. As a result there are lot of developments taking place in the IT industry. Lot of jobs have been lost. On the contrary, Assemble lines in automobile industries are becoming modern and hitech. Mechanical Engineers need not worry about dirty shop floors. They are neat and tidy. There are also other opportunities such as computational fluid dynamics, software related areas such as CADCAM (computer-aided design/computer-aided manufacturing), or in research-intensive areas. Since scooters are driven mainly by young women professionals in the cities, companies are driving women into their assembly lines. Women are sincere in job and good productivity. Also women car buyers are on the increase. So auto companies have been focusing on features making driving easier for them. So women folks have many good reasons to get into Mechanical and Automobile Engineering said Madhuri, a 3rd year Mechanical Engineering student. I have been inspired by Bindu akka, who bagged prize in a national competition fighting with 400 plus participants. That has inspired me to get into Mechanical Engineering she informed. D. Harika, Final Year student of Mechanical Engineering wants to prove that girls are equally capable as men in automobile industry. That is why I chose this stream, she said. I was never interested in Software and computer jobs. I have chosen Mechanical Engineering much against my parents wishes. I have got a job in John Deere India informed K. Sowmya, a fourth year Mechanical Engineering student. V. Sharon says why can’t women do Mechanical Engineering jobs. I want to make a career in Automobile Industry, she said. Pratyusha says there is a mad rush to Computer Science and Technology courses. I want to do something different. Yamini, a 3rd year Mechanical Engineer students aspires to get a job in Ashok Leyland. Young girls are not hesitant to work in otherwise not so soft jobs like automobile assemble lines. The core engineering streams such as Mechanical and Chemical Engineering is back in demand. And more and more girls are choosing them.